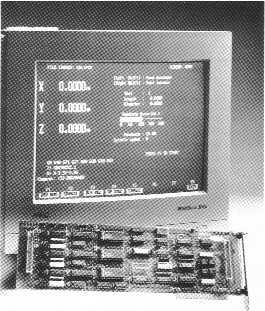 CNC-1000 is a software program that runs on an 80386 or higher computer with an available ISA slot in conjunction with the Servomotive MC-3628 3-axis motion controller board. CNC-1000 provides a highly developed and very cost effective Computer Numerical Control for milling applications. Running under DOS it requires minimal computer resources. CNC-1000 is completely menu-driven, making the application very easy to use. It features a high resolution graphical part preview, built-in program editor, four distinct operating modes and automatic parameter retention. CNC-1000 supports EIA RS274D format G codes, M codes, canned cycles, cutter compensation, real time feedrate override and polar as well as cartesian coordinate systems. Automatic mode runs an entire program to completion. The operator may pause the program for tool changes, speed changes, etc. Auto mode also permits single step, block delete and dry run. MDI mode permits the operator to operate the machine executing one command at a time. This mode is useful for setup, and fine tuning portions of a part program. Jog mode permits direct control of all three machine tool axes from the computer keyboard. Graphic mode permits the operator to visualize the tool path at an accelerated rate. Features such as block delete, optional stop and single stepping function in Graphic Mode. The Graphic mode also provides an estimate of the time to complete the part. 2 or 3 axis simultaneous motion, (linear, circular, and helical interpolation) for milling applications with programmable velocity and acceleration limits. Tool diameter offsets calculated in real time. G-Code command format conforms to EIA RS-274D standard. DRO (Digital Read Out) with adjustable character size. English/Metric independantly selectable for tools and/or program path. Programmable feedrate .01 to 100 IPM..
Manual real time Feedrate Override from 0% to 200%. Programmable resolution of .0001 inch. MDI (Manual Data Input) Run Immediate Mode. Programmable dwell 0.001 to 65 seconds. User defined variables with addition, subtraction, multiplication and division. 3D Color Graphics of tool path with zoom, search, single move, optional stop and block delete operations. Accurate job cycle time estimation. Six fixture (work) offsets (G54-G59). Automatic retention of systemparameter settings. G92 offset in conjunction with fixture (work) offsets. Nesting of programs and DO Loops. Part scaling, mirroring and rotation. 40 tool registers storing length and diameter. G Code canned cycles, additioned canned cycles may be user defined. Auto fillet between programmed moves. Jog tool length and work offset calibration. Search, single step, block delete, and optional stop supported in Automatic Mode. Adjustable reversal compensation for each axis. RS-232 (serial port) communications for transfer of milling programms. 3 axis jog control as low as .0001 inch incremental steps. The CNC-1000 package includes the CNC-1000 software, operation and programming manual, along with the MC-3628 3 axis servo controller board, MC-3628CB connector board and MC-3628CA cables. A detailed application manual is included covering machine tool evaluation for retrofit, suggested vendors for ball screws, backets, amplifiers, encoders etc and generalized wiring diagrams for installation of the control.